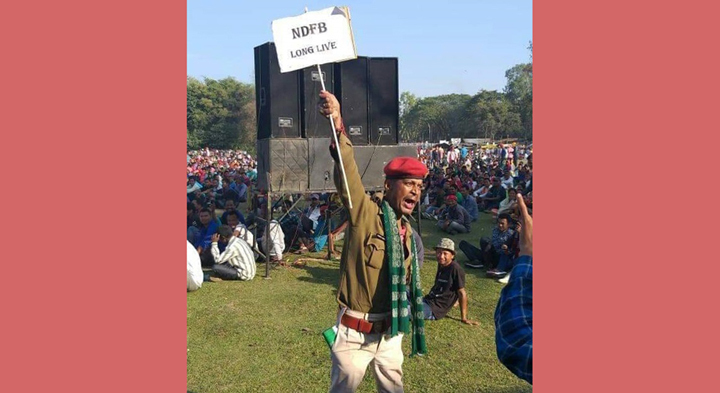 In a bizarre incident, a photograph of a police constable holding a placard reading as ‘NDFB Long Live’ has caught everyone’s attention and went viral on the social media. The incident has embarrassed the police department as NDFB is a rebel outfit which has been involved in the infamous October 30, 2008 blasts and anti-government activities. According to information, the constable, who has been identified as Lakhyadhar Deka, was on duty at the protest programme in Udalguri town on Tuesday. The protest programme was held under the aegis of the Bodo Women Justice Forum, Bodo People’s Committee for Peace Initiative (BPCPI) and the Society for Indigenous People’s Rights (SIPR) where thousands of protestors raised voice demanding release of National Democratic Front of Bodoland (NDFB) chairman Ranjan Daimari. NDFB chairman Ranjan Daimari was sentenced to life imprisonment by the special court of the Central Bureau of Investigation (CBI) recently. Ranjan Daimary was found guilty in the October 30, 2008 serial bomb blasts in Assam and was convicted to life imprisonment by the CBI special court. It seems out of excitement, the police constable wearing a traditional Bodo ‘Aronai’ around his neck took hold of a placard (with words hailing a rebel outfit) from one of the protestors. Meanwhile. Udalguri police have taken up the matter seriously and the constable is being currently interrogated at Udalguri Police Station. “We are enquiring the matter and if necessary action will be taken against the constable,” said the officer-in-charge of Udalguri Police Station, Narayan Patangia.